Enjoy the wonders of New Zealand as you pass from north to south, exploring the cities of Auckland, Queenstown, and Christchurch, marvel at natural wonders in Rotorua and Milford Sound, and enjoy the incomparable hospitality and beauty of this South Pacific nation. This 8-day vacation showcases the natural beauty and welcoming culture of New Zealand. Begin your New Zealand vacation in the country’s largest city, Auckland. 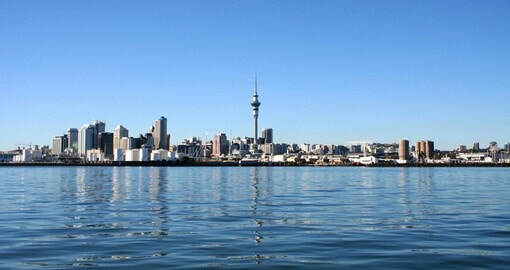 In Auckland, tour the stunning waterfront and climb Mt. Eden to enjoy panoramic views of the city and its gorgeous twin harbours. ​The next day depart Auckland and head south, stopping at the Hobbiton Movie Set along the way to explore all things Lord of the Rings. Then continue to Waitomo, where you’ll delve underground into the magical Glowworm Caves, where thousands of bioluminescent glowworms light up the caves like the night sky. ​From Waitomo travel to Rotorua, to spend the next two nights. 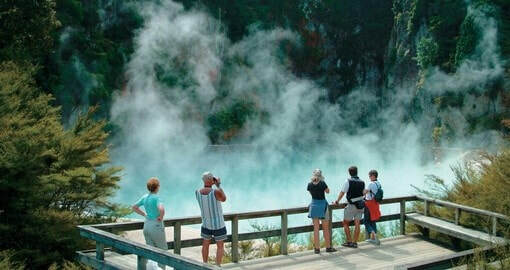 Rotorua is a natural marvel known for its geothermal activity, including boiling hot springs, bubbling mud pools, and exploding geysers. The city is also one of the country’s centres for Maori culture; where you can enjoy a traditional Maori evening of food and entertainment, as well as a sheep shearing exhibition during your stay to get in touch with traditions, past and present. From Rotorua fly to Queenstown on the South Island. 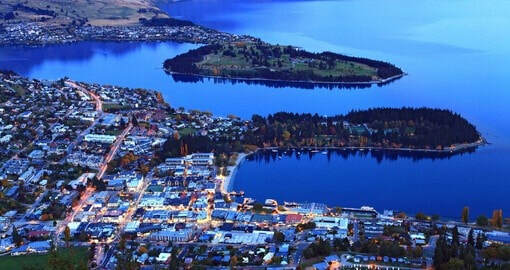 This area is home to the rugged, snow-capped Remarkable Mountains towering over the deep blue waters of Lake Wakatipu, fringed by poplars and weeping willows that form the backdrop to Queenstown - probably New Zealand's most spectacular and popular resort town. Here you will find something for everyone. Spend three nights here and indulge your inner daredevil by bungee jumping, sky diving, or jet skiing. You can also take a day trip to the magnificent fjord, Milford Sound, to enjoy a day cruise and take in the majesty of towering Mitre Peak. Take the opportunity to be guests of a "Kiwi" family in Rotorua. Your hosts will pick you up at the hotel and take you to their home for dinner and overnight. After a hearty country breakfast the next morning, you will be taken back to the hotel. This once in a lifetime opportunity!! Depart Queenstown and travel through some of New Zealand’s most picturesque countryside on your way to Christchurch, known as the nation’s Garden City. Enroute stop at the quaint Church of the Good Shepherd, possibly the world's most photographed church. 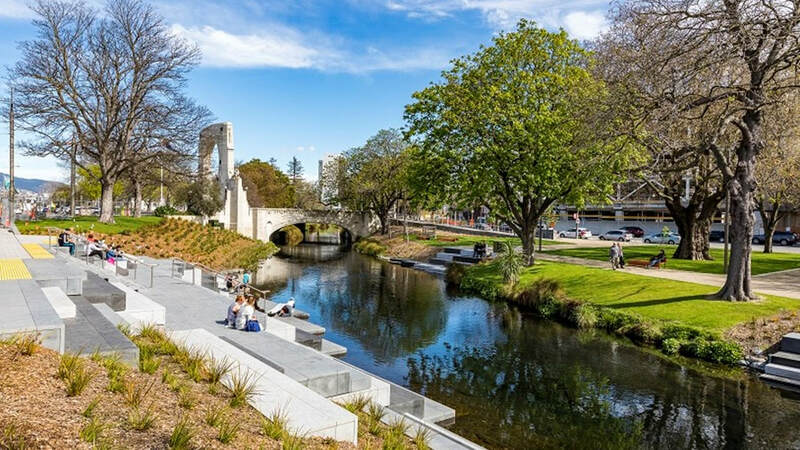 ​Spend one night in Christchurch and explore the city's distinctly-English atmosphere and visit the neighbouring countryside to enjoy the island’s pastoral charms before closing out your New Zealand vacation. The staggering variety and lush beauty of its 400 uncrowded golf courses have given New Zealand its well-deserved reputation as a "golfers' paradise." It is impossible to travel farther than 30 miles without coming upon a golf course.. New Zealand is also one of the most inexpensive golfing countries in the world, and the green fees ranging from NZ$5 to NZ$40, are an incredible value. Don't be surprised by some unusual hazards: boiling mud pools, steaming thermal vents and even the occasional sheep. New Zealand cuisine is based off of the country’s British roots with Mediterranean and Pacific Rim influences, as well as traditional Maori recipes, With a population of over 4 million compared to a sheep population of around 50 million, it is no small wonder that lamb is one of the most popular dishes domestically as well as being an important export. New Zealand leg of lamb is particularly known for its flavour and tenderness. Traditional New Zealand dishes include lamb, pork and venison, salmon, crayfish, bluff oysters, whitebait, mussels, scallops, kumara (sweet potato), kiwifruit, tamarillo and pavlova. In terms of Maori cooking, a Hangi feast should not be missed. There are numerous vineyards and wineries located throughout New Zealand. West Auckland, Gisborne, Martinborough and Hawke’s Bay on the North Island and Marlborough, Central Otago and Canterbury on the South Island are considered the best. Many wineries are open for tastings and some even have fine dining restaurants on site. New Zealand chardonnay, pinot noir and Bordeaux have come to international critical acclaim with many wine critics claiming New Zealand Sauvignon Blanc to be the best in the world. In terms of beer, the most popular kinds in New Zealand are pale or amber lagers. The two largest breweries are Lion Nathan and DB Breweries, between them, they make up 90% of sales in the country. Along with these major players are more than 50 micro-breweries that provide a wide variety of beers based on region and often offer tastings and tours.